Let’s escape a weekend away to the rainforest of Pulai – Johor National Park. Far away from the bustling sound of the city, deep into the wilderness of Pulai. Come join us on a memorable relaxing weekend. 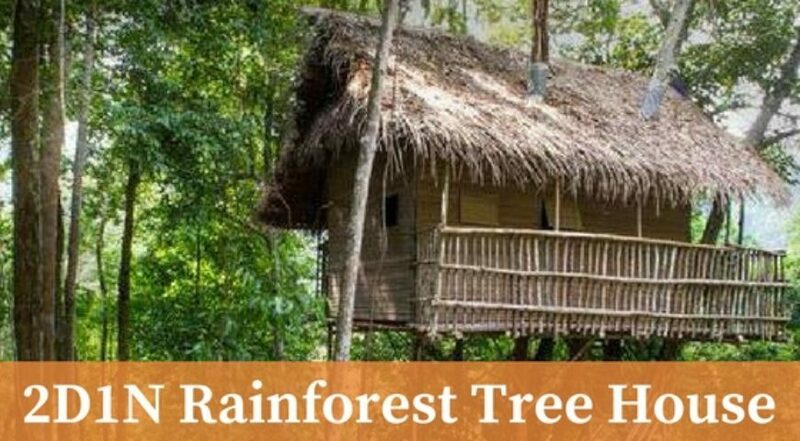 Rainforest Tree House offers rich nature, peace and serenity. It is situated at Gunung Pulai in Johor Bahru, which is only an hour drive from Singapore. How many Tree Houses located at this place? There are 4 small tree houses (with max capacity of 6 people) and 2 big tree houses (with max capacity of 12 people). You need to climb up the stairs (at least 10 minutes) to reach the tree houses. Is the Tree House Furnished? The tree houses are furnished with electrical outlets, mosquito nets, beds, blankets & pillows. The bathrooms have toilet bowls, basins and showers. Water comes directly from the mountains, so be prepared for a cooling splash! Also, communal hall for more than 60 people. What Activities you could do at the Tree House? or You can transfer to the below account no. Account Name : SGTREK PTE. LTD.
2.30pm waterfall trip(20min self walking distance) or visitor our natural farm or enjoy our facilities like tree net ,tree top tower , hammock and join us prepare dinner with wood fire . Check in at 2pm and check out at 12 pm. Amenities Include: power plug, mosquito net, blanket, cotton pillow, comfortable mattress bathroom with cold stream water shower and toilet bowl.